When the Last Angel Falls, the Fight for Mankind Begins. At a remote desert truck stop, the fate of the world will be decided. Evil's armies are amassing. Armed and united by the Archangel Michael (Paul Bettany), a group of strangers become unwitting soldiers on the frontlines of the Apocalypse. Their mission: protect a waitress and her sacred unborn child from the relentless, bloody siege of the demonic legion. Also starring Dennis Quaid, Tyrese Gibson and Lucas Black. $17.501 million on 2476 screens. Panasonic 50" TH-50PZ77U 1080p Plasma Monitor; Sony STR-DG1200 7.1 Channel Receiver; Panasonic DMP-BD60K Blu-Ray Player using HDMI outputs; Michael Green Revolution Cinema 6i Speakers (all five); Kenwood 1050SW 150-watt Subwoofer. If nothing else, 2010’s Legion deserves credit as a film about an impending apocalypse that never involves Mayan prophecies, the hot topic of the moment. Instead, this one goes Biblical – literally. 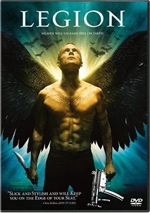 The Archangel Michael (Paul Bettany) comes to Los Angeles on a mission. After a quick confrontation with a powerful force, Michael heads for the remote desert town of Paradise Falls. Why? To protect an eight-month-pregnant single mother-to-be named Charlie (Adrianne Palicki). We learn that her baby – which she plans to give up for adoption – holds the key to mankind’s ultimate salvation. Michael needs to protect the unborn kid from a vengeful supernatural horde. In a world rapidly being consumed by overwhelming forces, Michael bands with a ragtag group at a Paradise Falls diner to battle the foes and keep Charlie – and her baby – alive. Traditionally, January serves as a dumping ground for movies studios simply want to wipe off their slate. No one expects them to do much; they’re often titles that don’t seem to have much going for them, so Hollywood plops them in the winter doldrums to be rid of them. Legion appeared to fall into that category. It didn’t get a lot of fanfare, it earned mediocre – at best – reviews, and it didn’t do much at the box office. The whole think stunk of “January shovelware” to me. Which means I must chalk up Legion as a pretty pleasant surprise, as it takes a somewhat stale concept and turns it into an enjoyable action flick. Despite the Biblical/apocalyptic trappings, Legion remains a Western at its heart. Or at least a horror Western. With its “last stand” motif, Legion clearly reflects the Western theme, but its action emphasizes horror material straight out of the zombie genre. It also throws in a more than healthy dollop of The Terminator. We find a protector who comes to save an unborn future savior in both. Sure, the details differ, but the concept feels about the same. Heck, this film’s Charlie and Terminator’s Sarah are both waitresses to boot! To some degree, I could call Legion a simple mishmash of inspirations and genre basics, and that accusation wouldn’t be far off-base, as the movie never does anything to open up or redefine any of its genres. It also drags at times due to too many long, futile attempts at character development and too much chitchat. You can take the movie’s theological elements and toss them out the window. Perhaps the filmmakers intended to prompt discussion of various religious topics, but if so, they didn’t succeed. The flick comes with such a muddled viewpoint that the theological aspects make little impact. The involvement of God gives the movie a grander “end of the world” scale than most, but those components don’t make the movie any deeper than the average action film. I’m willing to forgive these flaws, however, simply because when it works, Legion works really well. Take the scene in which elderly Gladys Foster (Jeanette Miller) comes to the diner. This sequence totally plays against expectations and becomes a legitimate hoot. Even though the film’s trailers give away the surprise, the scene still flies and gives us the kind of wild, creepy fun we want from a movie like this. The Gladys sequence doesn’t stand alone, as Legion comes at us with plenty more action along the way. Some of these sequences prove to be truly memorable, and they allow us to make it through the more tedious parts of the film. Without a doubt, Legion has flaws, but it boasts enough entertainment value to compensate. 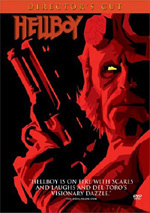 Legion appears in an aspect ratio of approximately 2.40:1 on this single-sided, double-layered DVD; the image has been enhanced for 16X9 televisions. While not a bad SD-DVD presentation, the transfer was more erratic than I’d like. Some of the inconsistencies came from sharpness. Parts of the movie exhibited good clarity and definition, but more than a few exceptions occurred, especially in wide shots. Those tended to suffer from notable jagged edges and some shimmering. Overall delineation was fairly good, but too many unattractive shots appeared. Some light edge haloes occurred, and other forms of artifacting marred the presentation. I noticed a bit of mosquito noise, and the movie occasionally looked grainier than it should. Various print flaws were absent, however, as the film lacked specks, mars or other distractions. To fit its apocalyptic setting, Legion went with a restricted palette most of the time. In essence, we got faded browns or chilly blue-greens; a few other tones emerged on occasion, but this usually remained a limited set of colors. Even given those restrictions, I wasn’t especially impressed by the hues. They seemed a bit messy and lacked great clarity. Blacks were similarly erratic. Dark tones tended to be somewhat flat and inky, and shadows were up and down. Some low-light shots offered decent clarity, but many were rather dense and tough to discern. I found enough positives here to make this a “C” transfer, but the concerns made it inconsistent. On the other hand, I couldn’t complain about the film’s Dolby Digital 5.1 soundtrack. As I expected, Legion offered a fairly dynamic soundfield that used the five channels in a satisfying manner. The action sequences were the most impressive, of course, especially when hordes attacked the folks in the diner. Gunfire and general mayhem swarmed the spectrum and added a lot of punch to the proceedings. Audio quality was satisfying as well. Effects played the most prominent role. All sounded clear and accurate, and these elements offered nice low-end response; bass was consistently deep and firm. Music presented good range and clarity as well, and speech was crisp and concise. I felt pleased with this nice soundtrack. Three featurettes show up here. Creating the Apocalypse goes for 23 minutes, 41 seconds and provides notes from special effects makeup creator Glenn Hetrick, director/co-writer Scott Stewart, 2nd unit director/stunt coordinator John Medlen, puppeteer Larry Odien, production designer Jeff Higinbotham, and actors Dennis Quaid, Doug Jones, Willa Holland, Adrianne Palicki, Jeanette Miller, Kate Walsh, Paul Bettany and Lucas Black. The show looks at stunts and various effects related to the “Ice Cream Man” and Gladys characters, and an animatronic baby. The concentration on technical areas makes this an interesting program, as we get good thoughts related to the subject matter. Humanity’s Last Line of Defense runs 11 minutes, 30 seconds and features Stewart, Walsh, Palicki, Quaid, Bettany, Black, Holland, and actors Charles Dutton and Tyrese Gibson. This one examines cast, characters and performances. Programs of this sort tend to be high on praise and low on content, and that proves true here. “Defense” lacks much substance and doesn’t give us much of interest. Finally, From Pixels to Pictures fills 10 minutes, 55 seconds with remarks from Stewart, on-set visual effects supervisor Gray Marshall, and visual effects supervisor Joe Bauer. As expected, they dig into some of the movie’s visual effects. The piece acts as a good complement to "Apocalypse” and offers nice details about the film’s CG elements. A few ads launch the disc. We get promos for The Runaways, Justified, Youth in Revolt and Unthinkable. Most of these also appear under Previews along with clips for Grown Ups, A Prophet (Un Prophete), Wild Things: Foursome, Shinjuku Incident, Chloe, Salt, Rescue Me, Harry Brown, The Road and 2012. No trailer for Legion shows up here. I went into Legion with low expectations but discovered a pleasant surprise. Though the movie sags at times, it still offers enough good thrills and action to make it enjoyable. The DVD provides strong audio but comes with mediocre visuals and extras. While the DVD doesn’t dazzle, I think the movie is worth a look.